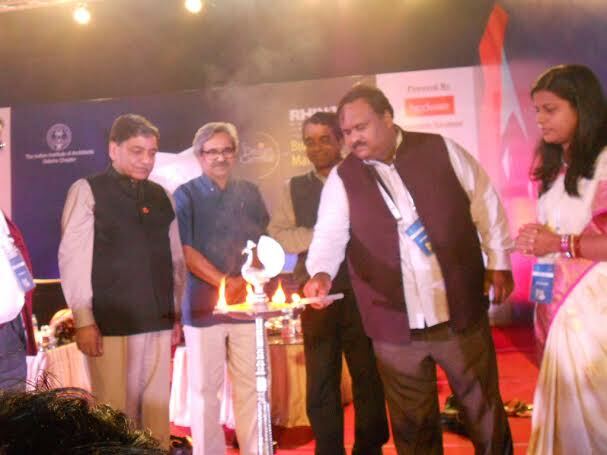 The Indian Institute of Architects, Odisha chapter launched its 9th annual event “Design Carnival” and Building material expo here at Janta Maidan, Bhubaneswar on Jan 29. Mr. Madhusudan Padhy IAS inaugurated the ceremony in the presence of Mr Dibya kush President IIA, Ar. S K Das and Ar. Sagarendra Mohapatra, Chairman IIA Odisha Chapter. Chapter chairman Ar. Sagarendra Mohapatra delivered the welcome address & in his speech he highlighted some vital points like base FAR of 1.2 recently introduced by Govt. This will certainly affect city development & expansion. Ar. Sabyasachi Mohanty gave the vote of thanks and Ar. Sgarendra Mohapatra, Ar. Dillip Shaw & Ar. Rabi Mohanty felicitated the guests. The program will be there for 29th, 30th & 31st January. The event will witness large congregation of Architects planners, thinkers, and policymakers across the country. The brain storming session will focus on the theme “Urban Rejuvenation”. This will support the state as well as the country in policy making at current movement of smart cities. There will be several competitions between the students of Architecture of seven different colleges of the state i.e. Design competition, sketching, face painting, seminars, cultural events to enhance the awareness between the students. In backdrop of Design Carnival a material expo is arranged by IIA Odisha chapter. This will be open for general public from 10 am to 10 pm daily. Reputed building material companies will display their innovative & latest building material products & it will immensely help the public for their building solution.